I have been following a number of RV forums and want to do a bit of a summary for those that don't have the time or interest to read a number of posts on this Blog: Remember more than half of the thousands of RVs that have been checked have been found to have one or more tire and/or axle in overload. So nect time you camp you can be pretty sure that one or both of the RVs parked next to you are overloading a component. - You should have a Digital tire gauge. I have posted the results of my tests of dozens of gauges that RVrs were using and the bottom line is that about 15% were off by more than 5 psi which IMO makes that tire gauge a good door stop or tent peg. I have provided information on how to do your own gauge "Calibration Check" to confirm the accuracy of the gauge you use daily and how to maintain your "Master Gauge"
- On your TV inflate to pressure based on the Door sticker and Owner's manual for "Fully Loaded" operation. BUT get on a scale at least once to confirm you are not overloaded. - If you have Motorhome you need to confirm your unit's "corner weights". Use one of the worksheets I have provided links to. Use Load/Inflation chart from your tire manufacturer, to confirm you are not overloaded and identify the heavier loaded tire on each axle. Using the pressure for that load add 10% (without exceeding the wheel max) and that is your Cold set pressure for all tires on that axle. - If you follow the above there should be no reason to be chasing your tire inflation around unless you have a major change in Morning temperature ( More than say 30°F ) as you would only need to "Top Off" the air once a month at most. 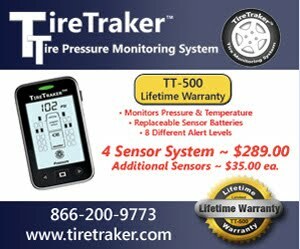 - TPMS are a WARNING device and like Insurance we should all be using them. Also just like Insurance they cannot "Prevent" bad stuff from happening but with luck they may give sufficient advance warning to lessen the impact of the bad stuff that does happen. - If you are parked for more than a day you need to cover your tires that will be in direct sunlight with WHITE tire covers. This protects against both UV and higher temperature damage which can shorten tire life.